Photoshop CS is a wonderful tool to use for adding to, subtracting from, filtering, rearranging, and generally playing with digital images. With the help of the Photoshop toolbox and palettes, you can be as artistic as you like, and knowing how to select what you want and get around the software is useful info. Whether you use a PC or a Mac with Photoshop CS, a keystroke or two can change the size of your brush, how opaque your tool is, and even paint a line. The following table shows painting commands for both systems. You often don’t want to edit an entire image in Photoshop CS, but instead just want to select and change a specific part. 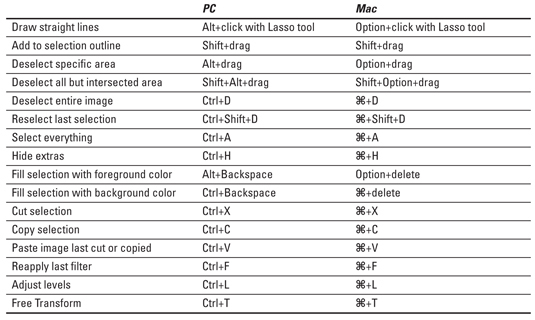 Photoshop CS offers a whole range of shortcuts to that let you select and edit only those pixels that you want, whether you use a Mac or a PC, as shown in the table below. Navigating through your photos with Photoshop CS is a breeze. You can zoom in and out and change the window size at the same time, and, if you use a Mac, you can toggle between the Photoshop window and other open windows. 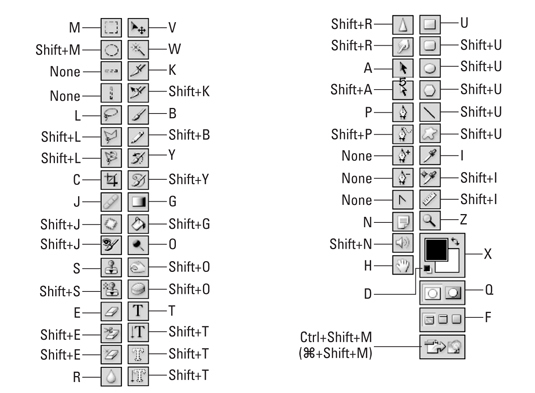 The following table shows you how to zoom through Photoshop CS.